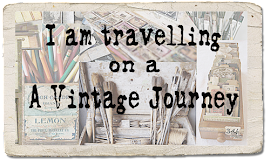 Hello Everyone, Jennie here welcoming you to a new month where you travel with four of the Creative Guides with a whole new set of wonderful products in the travel bag. As we are at Terminal 1 it falls to me to share with you the first project made from this months travel bag. 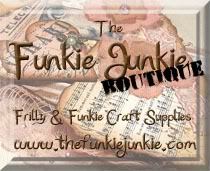 Well ....... what a fun and eclectic range of products! I really did have fun with this and got very messy too, although it nearly ended up in the bin at one stage! So here is the canvas I made using the Travel Bag Products. 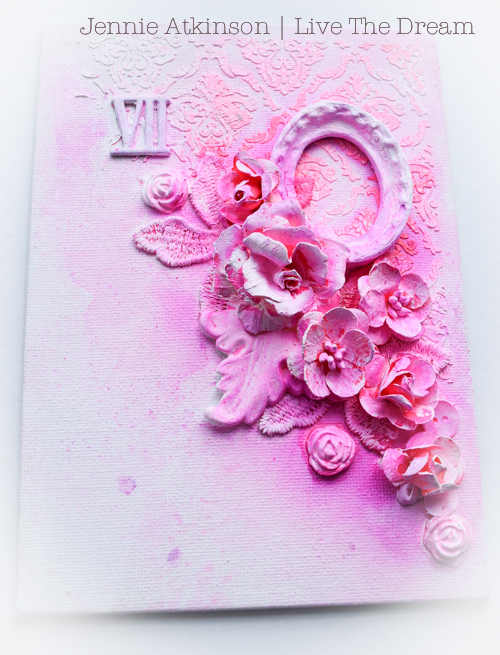 I started with a primed 5 x 7 canvas and added Crackle Paste through the Tim Holtz Gothic Layering Sencil (one of my favourites!) 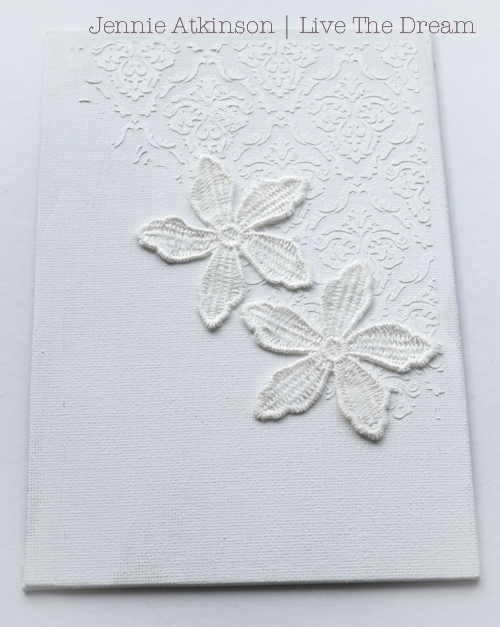 and then layered two lace flowers in the general area of where I thought I might add a cluster. So three of the four products used! ........ it all got sprayed with Dylusions Bubblegum Pink Spray. At this stage I thought I would start adding some white gesso here but then while I was clearing my table and waiting for everything to dry I managed to drop some blue spray ink over various parts of the canvas. No photographs of that bit I am afraid! I then really did have to go in with the white gesso and I really thought the piece was destined for the bin, especially after I added some gold too, but I kept going and so these final photographs are from the finished piece. 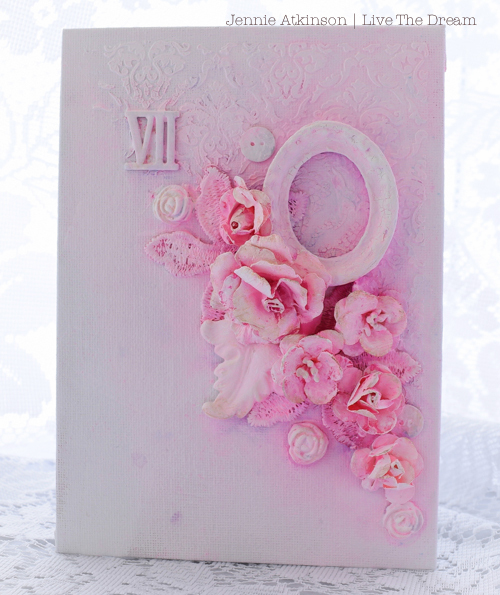 You can see how the white gesso has reacted in places with the sprays and the gold paint. Bits of the blue spray are still evident ! And once the Bubblegum pink spray is there it is very difficult to get it off! So a fun, experimental, pink and sometimes traumatic piece for you all here at Terminal 1 ! Do join us next Monday for the second leg of the June journey and another inspiring project with these four amazing products! 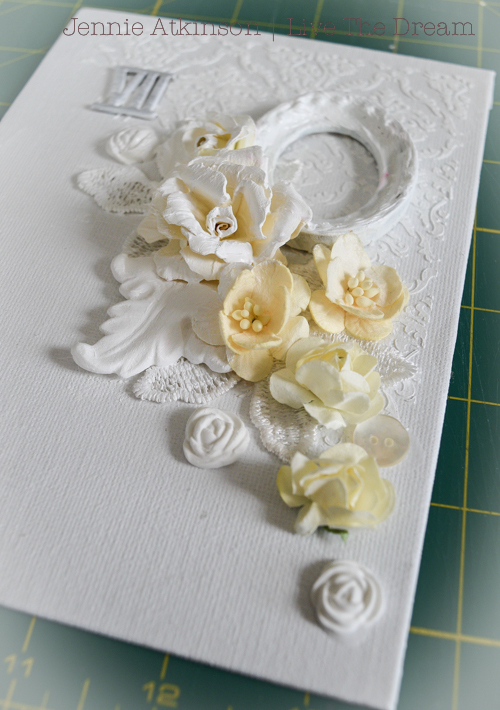 And of course don't forget our current challenge - Embossing Pastes and Textures - which you will find on the sidebar at the top of the page. Thank you for joining me today and whatever you do, have fun! Oh Jennie, when I saw that bubblegum pink on the DI list I thought oh my goodness, what are my dear DT sisters going to do with that...? but wow, you have made it look fantastic. I think that little accident was actually a really lucky one, the very subtle blue tones give a brilliant effect, and this piece has turned out stunning. The very soft gold and the way it worked together with the gesso and the spray, is another really beautiful subtle effect that adds additional depth. Love this little canvas!! A really beautiful canvas ! 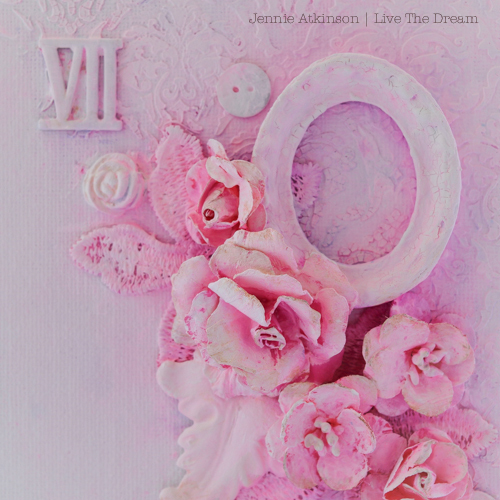 Jennie Love the stenciling, the cluster, the tones of blue with the bubblegum Pink and the effect of the gesso and gold too. Yep I guess that means I Love it all . So glad you didn't let 'the canvas see the bin 'as it really is a beauty. Now how weird am i? I loved it when it was just white with the pale yellow flowers! Guess I'm not a fan of bubblegum! But it is very beautiful, to me, at that stage! 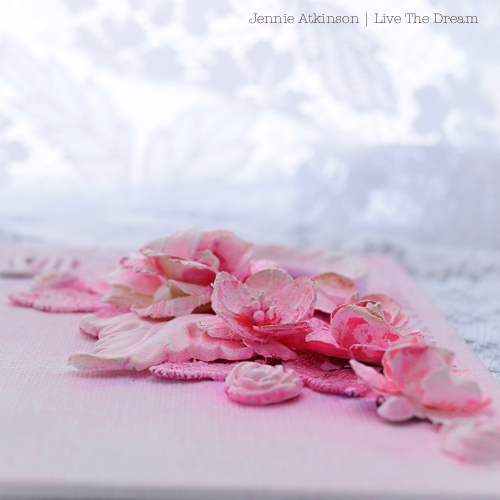 Jennie, your happy accidents paid off in the end, because this is the prettiest pink canvas I've ever seen! Beautiful flowers and embellishments to accentuate your lovely pasted background! Love it all! Hugs! Beautiful! Love the diagonal design and the colors. That pink is a real eye puller, Jennie. You have masked your happy accident so well, this canvas looks just so pretty! Stunning! It was gorgeous in all whites and the vibrant color added another wow! 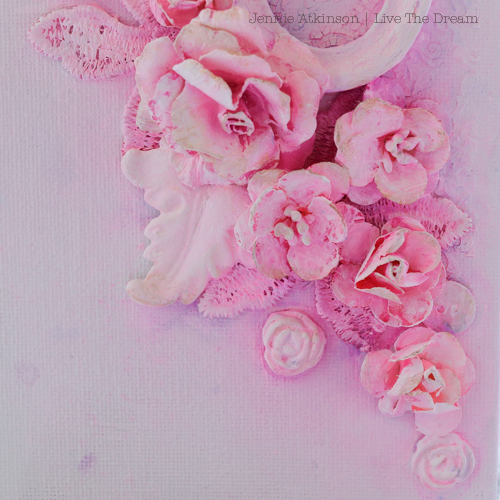 So pretty, Jennie - the composition is gorgeous and your vibrant bubblegum pink really zings! 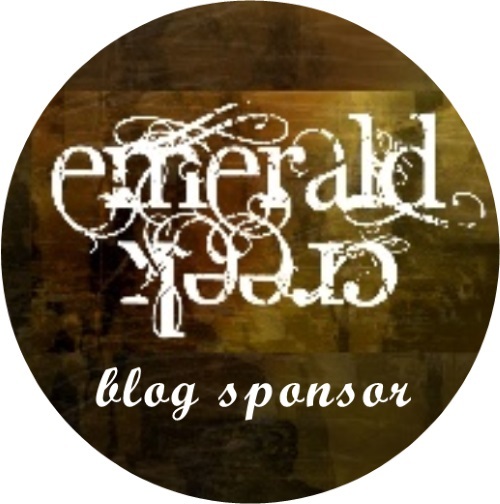 I guess I should start calling you Fancy Nancy - this is really beautiful - I like it at every stage!